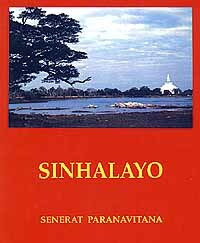 Sinhalayo by Dr. Senerat Paranavitana which was published by Visidunu Prakashakayo Ltd., in 1999 is a reprint of a book which first appeared in 1967 and we should be thankful to this publisher for resuscitating this almost forgotten masterpiece for the edification of the nation and people at large. The author is a legendary figure who is the acknowledged doyen of Sri Lankan historians and archaeologists whose works are both diverse as they are encyclopaedic. A classic instance of this combined erudition and encyclopaedic scope is his masterpiece on Sigiriya which is as monumental as the rock itself, for the insights into its unique character based on an analysis of the verses on its gallery walls. It is probably on the strength of this monumental work that a suggestion has been made for Sigiriya to be regarded as the eighth wonder of the world. Sinhalayo is a bigger undertaking which is no less than the history of the civilisation of Sri Lanka but it is a short synthesis of this subject which condenses it to a few dozen pages. The theme of Sinhalayo is basically the early history of the civilisation of Sri Lanka, as the creation of the Sinhalayos who were its indigenous inhabitants augmented later by immigrants. The original inhabitants were Indo Aryan in their language and culture who were attracted to the island around 5 centuries before the Christian era and founded the civilisation of the island which would endure for over 2500 years. Sinhalayo however is limited to a period of around 2000 years and this is the distinguishing feature of this work compared to other histories of the island. The reason for this is that this book confines the history of the Sinhalayos to the creation of the early civilisations in the island. The time scale of this history is around 2000 years from the earliest time till around the 15th century encompassing the beginnings, the Anuradhapura period differentiated into the early and later the Polonnaruwa period. A short chapter entitled the Decline is a later addition. Conceptually to say the least this is a different perspective of Sri Lankan history which covers a period of 2500 years almost up to the present time. This difference in time span is due to the underlying concept of Sinhalayo as basically the history of the Sinhalayos which ended around the 15th century. On this view the subsequent period witnessed the decline of Sinhalayo civilisation with the shift of the seats of power to the South West, the resultant civil wars between the Sinhala kingdoms culminating in the ultimate occupation of the country by European powers. The Kotte kingdom of Parakramabahu VI which saw the unification of the island including the subjugation of Jaffna would on this view be regarded as the culmination of the dominion of the Sinhalayo. No doubt there is justification for this view but it overlooks the achievements of the Sinhala monarchies which despite their struggle against foreign invaders distinguished themselves in the succession of kingdoms which arose in Kotte, Sitawaka with Kandy as the crowning glory and constitute therefore an epic and glorious chapter in the history of the Sinhalayos. It was in this manner that Sri Lankan rulers upheld the sovereign independence of the island for over 2500 years. Sinhalayo should therefore be considered as a study of the early Sri Lankan civilisations in the North which seem to represent to the author the unique achievements of the Sinhalayos. These civilisations were the outcome of the introduction of Buddhism to the island by Emperor Asoka in the 3rd century BC and it inspired a spiritual and cultural renaissance to which its extant religious monuments and artistic treasures bear immortal and eloquent witness. Dr. Paranavitana is regarded as the foremost authority on Sri Lankas early civilisations as several of its monuments are the fruit of his own excavations and to that extent this book Sinhalayo is unrivalled for its wealth of knowledge and information. No doubt this is a subject on which there are voluminous writings and publications representing over a century of scholarship but Dr. Paranavitanas Sinhalayo is unrivalled as a condensed and authoritative insight into this subject. The book has been described as a voyage of discovery and its author a Ulysses and this is precisely what it is as a exploration of the past which unfolds its splendour. The highlights of each period have been described under a number of headings such as architecture, sculpture, literature and in addition for the early period there are sections on inscriptions, economic conditions and Buddhism their object being to describe the foundations of the civilisation. As regards the dividing line between the three periods for the early Anuradhapura period it is the reign of Mahanama in the 5th century and the later Anuradhapura period begins with the reign of Dhatusena, and its highlight the building of Sigiriya which he describes as an earthly paradise that foreshadows the masterpieces of Khmer architecture. The Polonnaruwa period follows the traditional description of it as the creation of Vijayabahu following his victorious expulsion of the Cholians. This period ended around the 13th century due to the inability of the kingdom to withstand the pressure of foreign invaders like the Pandyans resulting in its transfer to successive kingdoms in the south west of the island. This period is regarded by the author as marking the decline of the Sinhalayo kingdoms in the island. Apart from the historical narrative this book is really a treasure trove of information on the architectural and artistic achievements of these civilisations. This is to be expected considering that the author was virtually the pioneer in this field and a veritable intellectual giant. The essence of this vast knowledge has been expertly condensed in this book giving it a unique quality as an authoritative history of the islands civilisations, despite its slender appearance. Indeed apart from being crammed with facts it is a virtual art gallery of designs, carvings, diagrams, figures taken from the monuments numbering up to 128 which provide a frame as it were to all the pages. To that extent it is unique as a publication on Sri Lanka history which combines authoritative texts with illuminating illustrations. This note will be incomplete without some reflections on the practical value of this publication and the purposes it could serve. Its unique feature is as an expert study of Sri Lankas civilisations which is a subject on which literature is relatively scarce. I recall that as a student we depended for years on the modest book by Dr. G. C. Mendis on the early history of Ceylon. At present while there is much writing on Sri Lankan history the bulk of them are on specialist themes or too lengthy to appeal to the average reader. This is the real merit of Sinhalayo in that it is easy to read or to handle and is unrivalled as the most authoritative work available on the early civilisations of Sri Lanka. It is therefore ideal reading for the general public and specially for schools where handy but readable works of this kind are rare. To foreigners especially the tourists converging on the island many of them keen to savour its ancient splendours which are the top tourist attractions this book can serve an invaluable purpose not just as a guide but an education. This Visidunu Prakashakayo publication it must be said is ideal for the purpose as in its handy size and attractive colourful appearance it can compare with tourist publications, with the difference that its contents are an invaluable introduction to the civilisation of the island.